Fans Flock to Saratoga for Songbird: Bird is the word for Saturday’s Grade 1, $600,000 Alabama at Saratoga Race Course, where Fox Hill Farm’s stellar Songbird will continue her pursuit of perfection in the meet’s marquee race for 3-year-old fillies. After sweeping four starts in a breeze last year, Songbird came within one vote of a unanimous accolade as Champion Juvenile Filly. The daughter of 2002 Travers winner Medaglia d’Oro remained untested through four more facile victories at Santa Anita Park earlier this year, and was then shipped to the Spa by Hall Of Fame trainer Jerry Hollendorfer for the Grade 1 Coaching Club American Oaks. First run in 1872 when Woodbine earned $2,650 for August Belmont, the Alabama has been won by 21 Eclipse Award winners. The stakes record of 2:00 4/5 is held by the immortal Go for Wand, who rests beneath the stars and stripes in the Saratoga infield. Barely settled in, Songbird emerged from the Oaks unbeaten but she did not go untested. The multiple graded stakes winner Carina Mia, stabled locally since late spring, ran up to Songbird’s throatlatch on the turn and a fierce struggle ensued. Songbird was up to the challenge, and, in the words of track announcer Larry Collmus, “whistled past the Graveyard of Favorites” under Hall of Fame jockey Mike Smith. Songbird’s owner, Rick Porter, campaigned 2000 Alabama winner Jostle, as well as Havre de Grace, the 2011 Horse of the Year who was beaten a neck in the previous year’s Alabama by Blind Luck. Songbird will break from post position 6 with Smith, a four-time Alabama winner. WinStar Farm’s Dark Nile was third with a troubled trip in her sprint debut, but the Pioneerof the Nile filly has since reeled off four consecutive victories since stretched to two turns by trainer Arnaud Delacour. Stepping up off a win in the Grade 3 Delaware Oaks, she breaks from the rail with Joe Bravo. “It’s a bit of an audacious spot, but she’s come along nicely and I’ve always thought she would stay a mile and a quarter,” said Delacour. Going for Broke, a Waterford Stable homebred, makes her stakes debut for Chad Brown. The Blame filly was a maiden winner second time out, and has since captured two allowance races. Going for Broke drew post 3 with regular rider Irad Ortiz Jr.
Go Maggie Go drew post 4 with Luis Saez. Beginning from post 5 is Gary and Mary West’s Family Tree, who won the Iowa Oaks June 30 and the Indiana Oaks 16 days later. “I stepped up to the plate and took a chance, everybody is like, ‘Sometimes you’ve got to do it,'” said trainer Wayne Catalano. Flora Dora and Weep No More, third and fifth in the Oaks, try Songbird again. Flora Dora breaks from the outside with Manny Esquivel, with blinkers on. 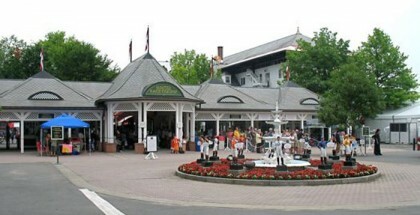 What’s Happening at Saratoga on August 20, 2016? Alabama, featuring Songbird: Saturday marks the second scheduled Spa appearance this season for undefeated champion filly Songbird, who is slated to continue her quest for a perfect campaign in the day’s feature race for the nation’s top 3-year-old fillies – the Grade 1, $600,000 Alabama. Guests are invited to commemorate the day with a free Songbird poster, presented by NYRA Bets, available at the “May I Help You?” booths near each gate (available on a first-come, first-serve basis; while supplies last). Individuals may also receive a special sign-up offer for NYRA Bets at the guest services booths with handicapping picks from NYRA’s Gabby Gaudet. Fourstardave Handicap: Saturday will feature a pair of Grade 1 races with the $500,000 Fourstardave Handicap for 3-year-olds and up at a mile on the turf. The Fourstardave will be run on Saturday after severe storms caused the cancellation of racing on its originally scheduled date of August 13. The Lustgarten Foundation Day: Saratoga will honor the legacy of trainer Dominic Galluscio with a day to benefit The Lustgarten Foundation, a non-profit organization whose mission is to advance scientific and medical research related to pancreatic cancer. Numerous trainers will participate in an autograph session in front of the paddock mutual bays near the racing office with a suggested $10 donation to benefit The Lustgarten Foundation from 11:30 a.m. to 12:30 p.m. The day will be highlighted on-track with decorative purple bunting throughout the venue. All jockeys riding in the day’s card will wear purple armbands. Fans are encouraged to wear purple to show their support for pancreatic cancer awareness. Guests who make monetary donations to The Lustgarten Foundation at the “May I Help You?” booths will receive a free purple pancreatic cancer awareness wristband. Galluscio, who died in 2014 from pancreatic cancer, saddled more than 1,000 winners during a 34-year career on the New York Racing Association circuit and his horses amassed total purse earnings of $31.3 million. NYRA Bets Lounge: Fans are invited to visit the NYRA Bets Lounge in the Saratoga Pavilion, presented by Time Warner Cable News. The NYRA Bets Lounge will offer handicapping tips and analysis from racing professionals and also features a full-service bar and Lifestyles clothing boutique. A handicapping seminar will occur from 11 a.m. to noon with Mike Penna of the Horse Racing Radio Network. Guests can also get tips from NYRA’s Gabby Gaudet at 1 p.m.
Low Roller Challenge: Saturday will feature the Low Roller Challenge, presented by NYRA Bets, which allows aspiring handicappers the opportunity to experience the thrill of tournament play for $40, with $30 going towards live bankroll and $10 to the prize pool. 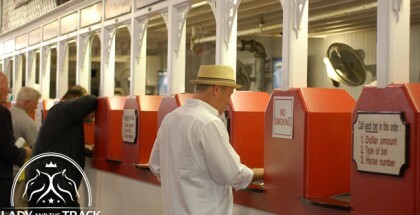 Registration begins at 11 a.m. at the NYRA Bets Lounge in the Saratoga Pavilion, presented by Time Warner Cable News. Community Outreach Booth: The Community Outreach Booth will host the Backstretch Employee Service Team, a non-profit organization which aids the hard-working men and women employed to take care of the horses in the barn area. Ketel One Party at The Post: The fun will continue each Saturday of the season with the Ketel One Party at The Post, the lively bar and entertainment spot adjacent to the paddock. Each Saturday of the meet will feature a DJ, trivia contests and prizes at The Post following the day’s final race. 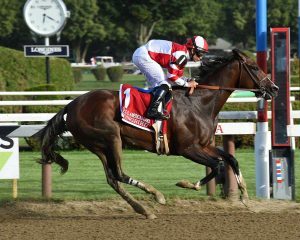 Can Songbird Enter HOTY Discussion with Alabama Stakes?